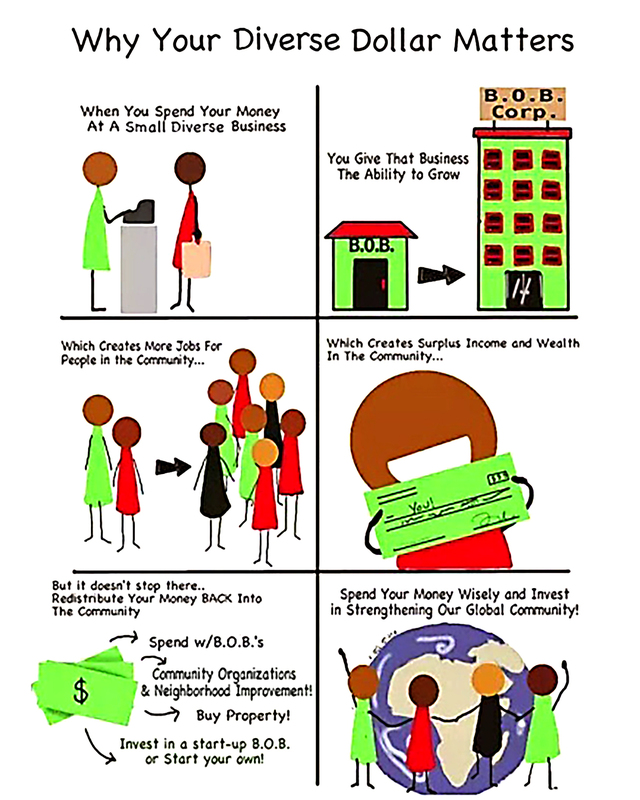 When you spend your money at a small diverse business, you give that business the ability to grow, helping to create more jobs, income and wealth in our community. The money you spend with these businesses gets redistributed back into the community to support local organizations, make improvements in our neighborhoods, stimulate our real estate market and invest in other local small businesses. Spend your money wisely and invest in strengthening our global community! To establish and implement proactive policies and programs to ensure institutional “equal opportunity” commerce with all business classifications; with measurable benchmarks, reflective of our community, that are monitored and strongly encouraged. Members: David Anderson, Michael Boerman, Dan Clark, Cheryl Cole, Jeff Danner, Melissa Davis, Nanci Guigue, Kathy Keating, Joe Milito, Eric Mullen, Julie Parks, Sarah Rose, David Selmon, Jim VanDokkumburg, and John VanElst.